He that would go to sea for pleasure would go to hell for pastime,’ runs the old saying. But where does that leave the bunch of hardy souls that beat their way out of the Western Approaches and into the North Atlantic in small boats in the name of recreation? 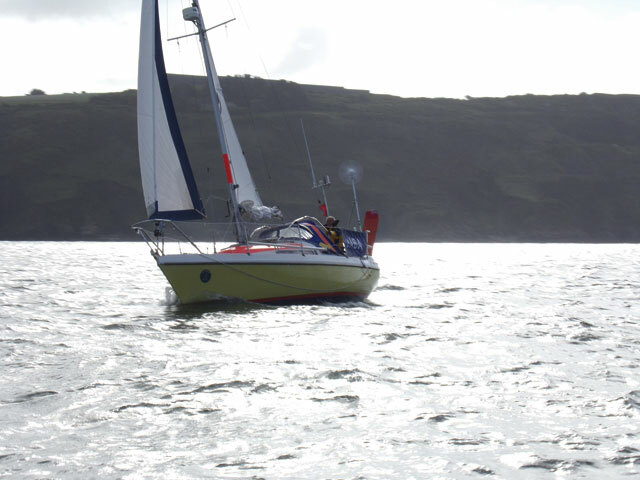 ‘A modern experiment in old-fashioned self-reliance, self-sufficiency and personal responsibility’ is how organiser Ewen Southby-Tailyour describes the Jester Challenge, an event that sees single-handed sailors pit themselves against the worst the Atlantic can throw at them to reach the Azores or North America. The event attracts a resourceful and practical bunch of sailors. Take Basil Panakis. 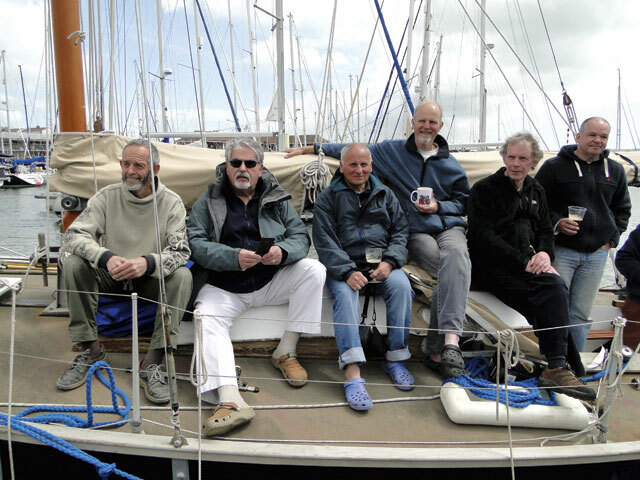 The softly-spoken 70-year-old from Southampton has competed in the Jester Challenge twice in a row in a boat smaller than some would deem suitable for a trip across the Channel. However, he’s not alone. Every two years, a group of delightfully mad people head to Plymouth for the start of a challenge like no other. Basil keeps his boat at Netley Cliff Sailing Club on the shores of Southampton Water. Jaba is a Contest 25, and she stands out from her fellow club boats – a yellow hull, a nest of aerials mounted on her stern, dayglo orange paint on her coachroof and mast, radar, wind generators and solar panels see to that. It’s a purposeful look that says she could go anywhere – which is exactly what Basil is aiming for. He has been sailing his whole life, learning the ropes sailing with his family as a child, and had long wanted to give the Jester Challenge a go. He bought Jaba for a knock-down price in Plymouth in 2007, paying only £5,200 for the boat. 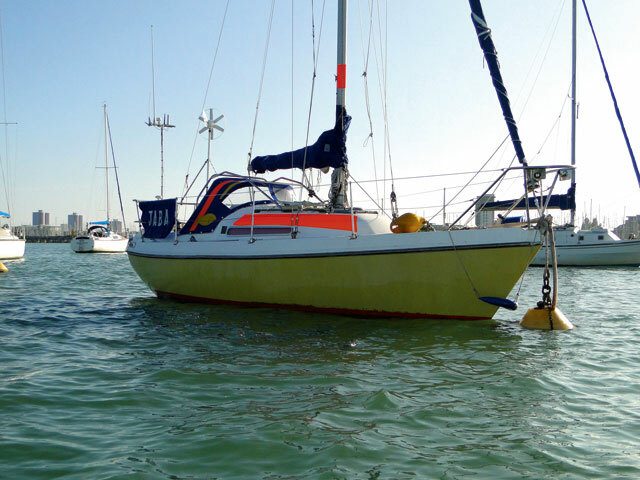 She was in good order but had old sails, limited electrics and needed a lot of work to bring her up to Channel-crossing standards, let alone to the sort of condition for a single-handed Atlantic crossing. With Jaba safely home and out of the water at Netley Cliff SC, Basil started planning his modifications to turn the boat from solid coastal cruiser to ocean-crossing yacht. As part of a full refit, the first thing Basil had done was to reinforce the mast step and chainplates. The Contest 25’s deck-stepped mast is stepped over the main bulkhead, but a doorway lies directly underneath. 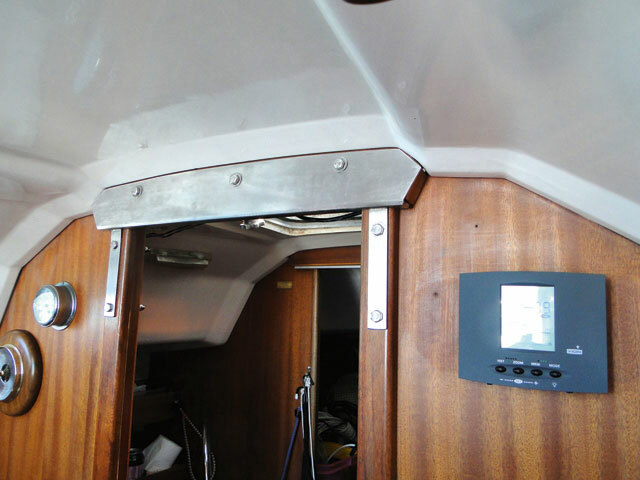 Basil had a stainless steel arch made up to reinforce the deckhead and bulkhead and to transfer the loads down the door frame. He also had reinforcement plates made up for the chainplates to spread the load and prevent damage to the main bulkhead. On deck, he had a sturdy frame made to strengthen the sprayhood and provide a good handhold for the cockpit and when climbing forward along the side decks. Despite the ‘Zimmer frame’ nickname appended by a fellow competitor, Basil has found the sprayhood frame works well. The addition of a rope strop to assist when clambering out of the companionway has also helped. 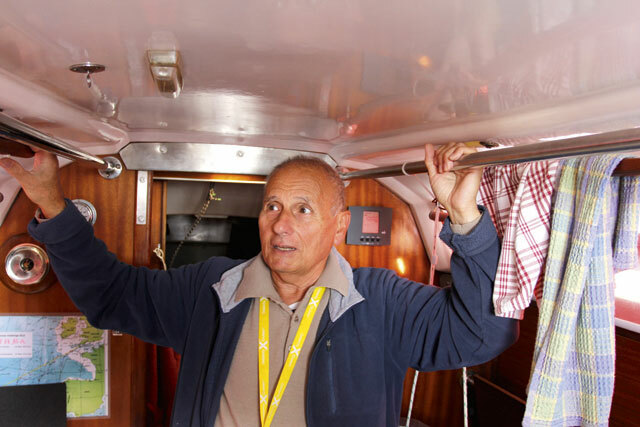 There were few handholds inside the cabin, so Basil has installed stainless steel grab rails running along the deckhead on both sides of the cabin. 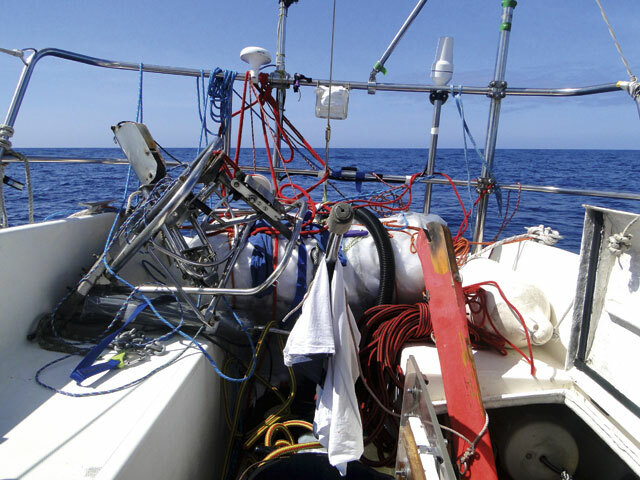 At sea, he also installs lines running each side of the bunks to add further handholds and reduce the distance he may fall if the boat tumbles off a wave. 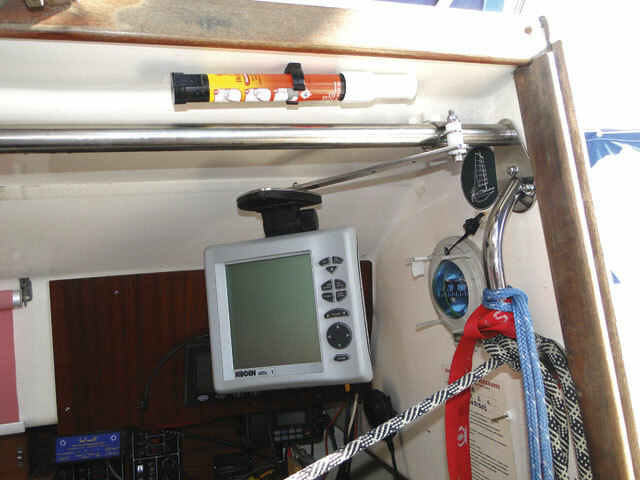 Dayglo orange paint on the coachroof and reflective tape up the mast help to keep Jaba visible at sea, but Basil has a veritable arsenal of electronics to make sure that nothing is left to chance. Basil has one 40W and two 20W solar panels installed on Jaba’s coachroof, and a Rutland 504 wind generator mounted on the pushpit. 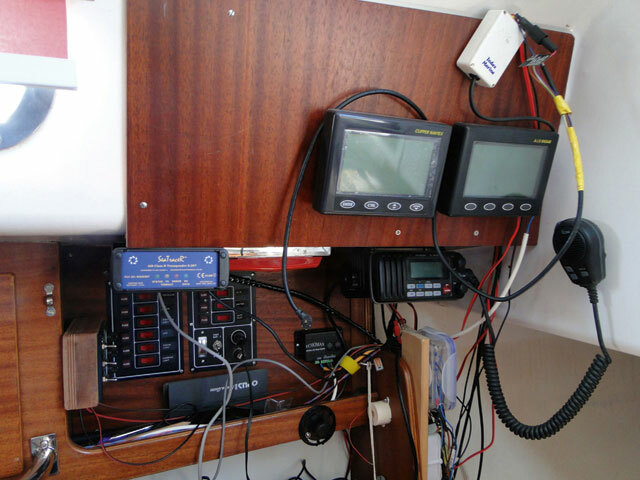 These keep his three batteries down below topped up, and in the brisk upwind conditions he experienced on the Jester Challenge in 2014 this gave him plenty of power to run his electrics – he barely had to run the engine to charge. 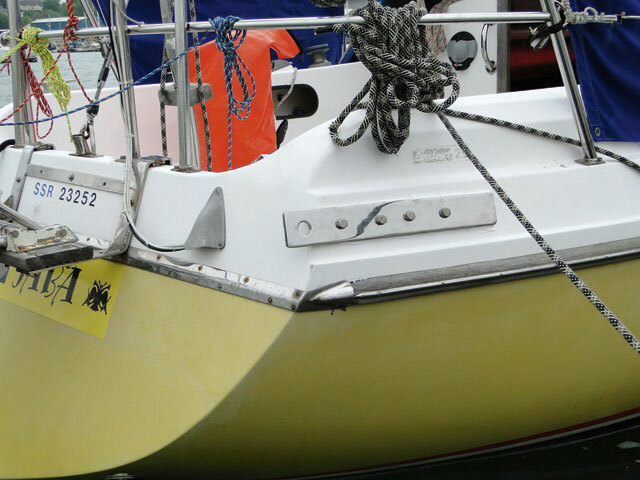 Basil has a Raymarine Tillerpilot, complete with waterproof cover, but most of his steering was carried out by Jaba’s Hasler self-steering gear. 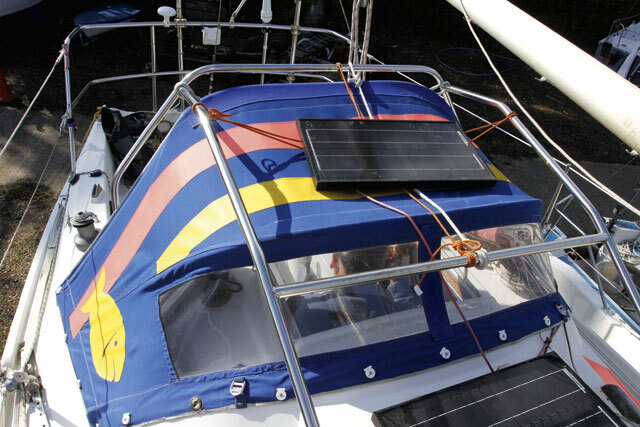 Following a failure of the stainless-steel bracket in a large sea, which resulted in an hours-long battle to bring the broken vane on board, Basil has now bought a second-hand Windpilot vane system, which is lighter and simpler, and plans to fit this over the winter ahead of his travels next year. 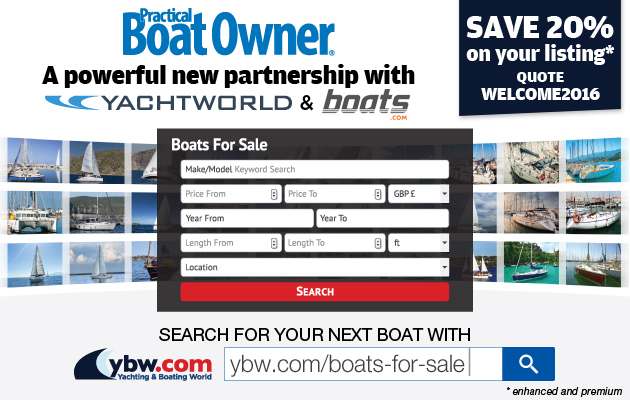 boat – shipping, for one – is made a lot easier with electronic aids. 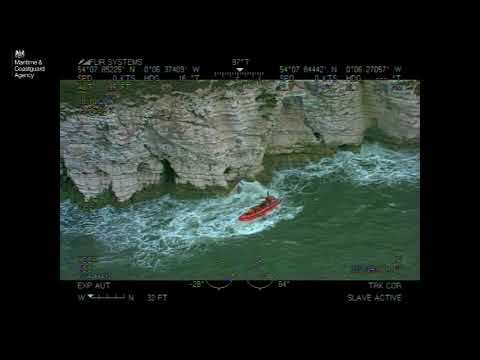 Add to that the punishing motion and wet atmosphere of a small boat in the open Atlantic and you need a good backup system. First up is radar. Jaba’s Koden radar is on a swivel mount so it can be seen both from the cockpit and from Basil’s bunk. He switches this on in poor visibility or when the AIS warns him of a ship at 12-mile range. On a rail at the transom is an AIS antenna, GPS, Navtex and spare VHF antenna, as well as the external aerial for an Iridium satellite phone. is an Echomax Dual-Band Radar Target Enhancer (RTE) which is always on. Basil has found that it blips when it detects a target at 25NM range. Basil has two GPS chart plotters on board. These can be mounted either inside or under the sprayhood in the cockpit – and he has made transparent vinyl covers for them to keep them dry. A third Garmin handheld GPS is kept in a metal box in the forepeak to protect it from lightning strike. For weather info, he has a NASA Navtex as well as a Furuno Weather Fax, which prints the forecast out onto rolls of paper. This has the advantage that, once received, he can refer back to them without using electrical power. He switches this on as and when a forecast is expected. It stows behind the starboard berth, over which a sliding table is mounted: this allows Basil to use his laptop, navigate and eat. All these electrics are vulnerable to a large green sea coming aboard, despite the large sprayhood. To combat this, Basil made a vinyl screen that attaches with Velcro to the cabin headlining, protecting the vulnerable electrics from any incoming water. Jaba’s navigation lights are LED – a Lopolight tricolour and Hella sidelights, which reduce current draw to the minimum possible. his cockpit clear and provides a strong, failsafe attachment point for the drogue. In the same vein, he has added beefed- up cleats and fairleads on the foredeck to cope better with anchor, sea anchor and towing loads in extremis. Basil has also installed a 3,700lt per hour electric pump in the cockpit to quickly empty the cockpit of water if the boat is pooped by a following sea. Victualling Basil has a 50lt flexible water tank, although he has found that the Plastimo models haven’t survived a rough Atlantic crossing. He has recently bought a Vetus alternative which he hopes will prove to be more tough. 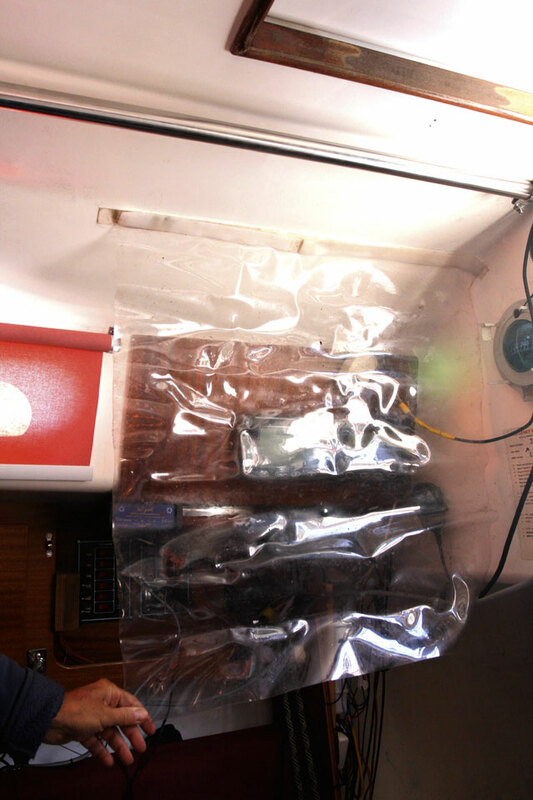 In addition to the tank he keeps 5lt supermarket mineral water bottles under the cabin sole and in the quarter berth. This gives him a total of 170lt of fresh water, which was plenty for his needs on the previous crossing. However, he was sparing with it, conserving water where possible; for instance by cooking his rice in the water from his tinned peas. ‘It tastes fine, as long as you ignore the green colouring!’ he laughs. 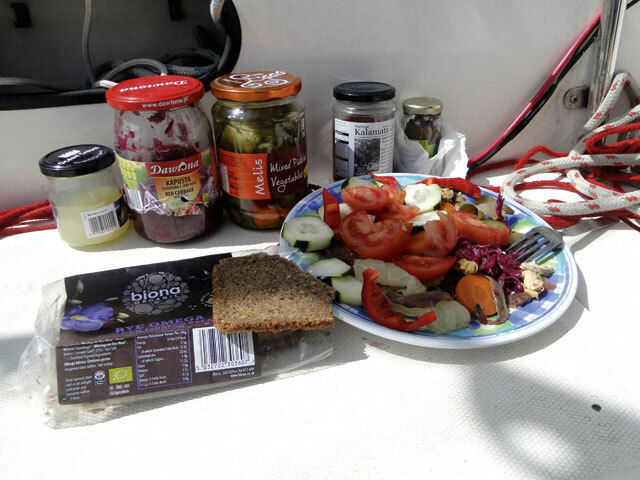 Eating is always at the forefront of solo sailors’ minds, and Basil’s staples are rice, pasta, new potatoes and German rye bread, which keeps for a long time, supplemented with olives and pickled vegetables. Once the fresh food ran out, food was by and large from tins, which he stored separately in fish, meat and vegetable lockers. That way, if the labels washed off he’d know roughly what was going into the cooking pan! Suitably equipped, Jaba has now taken part in two Jester Challenges with Basil at the helm. In 2012 he made it to the Azores and back, completing the challenge. In 2014 the destination was Newport, Rhode Island. Things were going well, and Basil made it to the Azores after 16 days, heading into Ponta Delgada to get some repairs made to his self-steering bracket. Duly repaired, Jaba set off westwards again, but after a fortnight of slow progress in light airs the vane broke again, with an at-sea repair impossible. Basil turned back for the Azores. A week later he was heading downwind and heard a bang – the forestay had parted. In a large sea he wrestled the jib down and secured the forestay, then gingerly headed for Horta. Repairs completed, three weeks later he arrived back in Plymouth. Jaba hadn’t made it to America as planned, but they’d had quite an adventure. So what’s next for Basil and Jaba? The Jester Challenge is heading to Baltimore this year, but Basil has his sights set further afield and, inspired by an article in the September issue of PBO, is eyeing up a trip to the Faroes this summer. Wherever he ends up, you can bet that Jaba will be well-equipped for the trip! A biennial event for yachts under 9.1m (30ft), its origins lie in the Observer Single-handed Trans-Atlantic Race (OSTAR) started by Blondie Hasler in 1960. But as that race became more commercialised, owners of smaller boats set up their own Corinthian event named after Jester, the custom-designed, junk-rigged Folkboat that Hasler sailed to second place in the inaugural OSTAR. 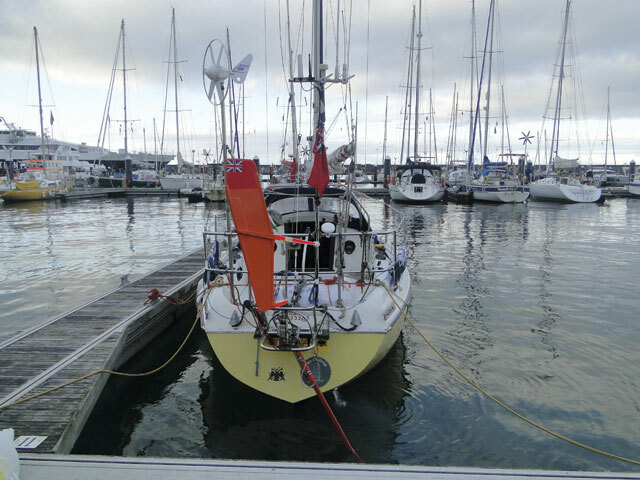 The Jester Challenge has historically alternated between the Jester Azores Challenge, from Plymouth to Ponta Delgada, and the Jester Challenge, to Newport, USA. The 2014 race to Newport was particularly gruelling, with only two finishers from 11 entries. Organisers are planning a new, shorter challenge for 2015, from Plymouth to the Irish port of Baltimore.